VANCOUVER, B.C. – February 2, 2016 – Home buyer activity remains at near record levels across the Metro Vancouver housing market. Residential property sales in Greater Vancouver totalled 2,519 in January 2016, an increase of 31.7 percent from the 1,913 sales recorded in January 2015 and a 10.9 percent decline compared to December 2015 when 2,827 home sales occurred. Last month’s sales were 46 percent above the 10-year sales average for the month and rank as the second highest January on record. 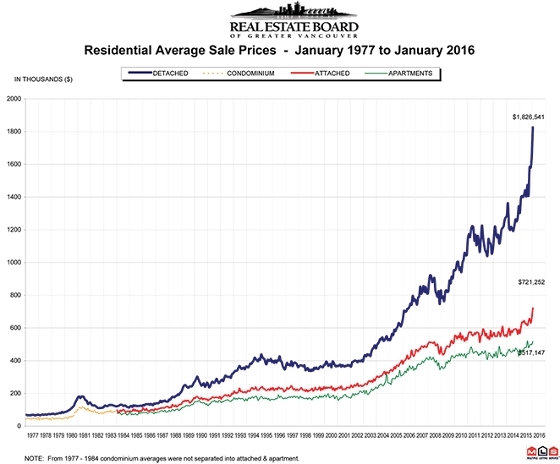 New listings for detached, attached and apartment properties in Greater Vancouver totalled 4,442 in January 2016. This represents a 6.2 percent decline compared to the 4,737 units listed in January 2015 and a 119.8 percent increase compared to December 2015 when 2,021 properties were listed. The total number of properties currently listed for sale on the MLS® system in Metro Vancouver is 6,635, a 38.6 percent decline compared to January 2015 (10,811) and a 10.1 percent increase compared to December 2015 (6,024). The sales-to-active listings ratio for January 2016 is 38 percent. This is indicative of a seller’s market. Sales of detached properties in January 2016 reached 1,047, an increase of 34.1 percent from the 781 detached sales recorded in January 2015. The benchmark price for detached properties increased 27.9 percent from January 2015 to $1,293,700. Sales of apartment properties reached 1,096 in January 2016, an increase of 35.5 percent compared to the 809 sales in January 2015.The benchmark price of an apartment property increased 19.4 percent from January 2015 to $456,600. Attached property sales in January 2016 totalled 376, an increase of 16.4 percent compared to the 323 sales in January 2015. The benchmark price of an attached unit increased 16.4 percent from January 2015 to $563,700.